Chadwick Gillenwater | What is ML Reading? Will There Be Six More Weeks of Winter? This past Monday – my prediction was no. It was 65 degrees. Today – after my hike to work through the ice and single digits I think yes. (Actually, it had warmed up to double digits by the time I started my trek.) We will know for certain on February 2nd when the groundhog does his job. In the meantime, some great groundhog books to read. 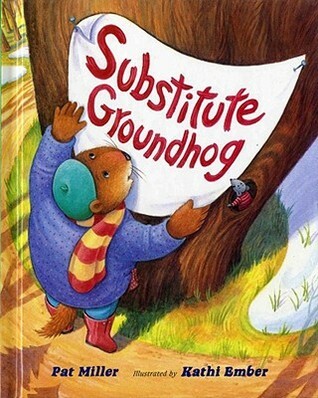 Substitute Groundhog by Pat Miller -With Groundhog Day approaching Dr. Owl diagnoses Groundhog with the flu. Groundhog takes his duties very seriously. He searches for a replacement… interviewing numerous candidates before going to bed as the doctor ordered. Sorry Dr. Owl, I’ve had the flu a few times in my life. I think you misdiagnosed. The world could have ended. I wouldn’t have cared. And job. What job? With all the fever and throbbing pain, I could barely remember my name. Thankfully, ML hasn’t experienced the flu. Nonetheless Groundhog finally finds a replacement and goes to bed. You’ll have to read the book to find out which animal predicted the weather. 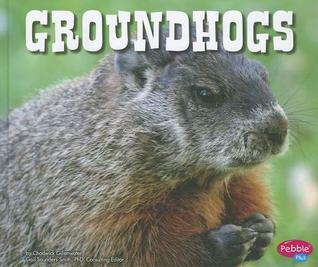 Groundhogs by Chadwick Gillenwater – I learned a lot from this easy-to-read, nonfiction text. ML the nature girl, already knew most of it. So she read it to me. We spent several minutes admiring the baby groundhog pictures. The only thing ML loves more than animals is baby animals. 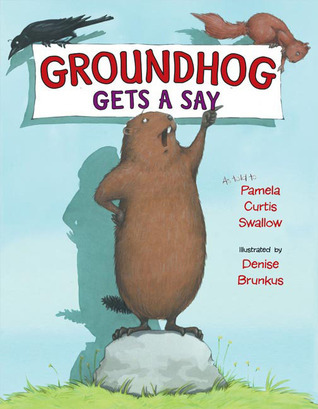 Groundhog Gets a Say as told to Pamela Curtis Swallow and illustrated by Denise Brunkus – Groundhog doesn’t like just having one day. He thinks he deserves a month. Squirrel and Crow do not agree. As Groundhog shares more and more about his awesome abilities, the animals reconsider. Squirrel had no idea they were cousins. Crow becomes more and more impressed with all groundhog can do. ML and I couldn’t believe during hibernation groundhogs take a breath around every six minutes. Their hearts beat every four to five minutes. An enjoyable, illustrated picture book with both a fun storyline and interesting information about groundhogs. Kids will enjoy learning the artist illustrated Junie B. Jones’ books. 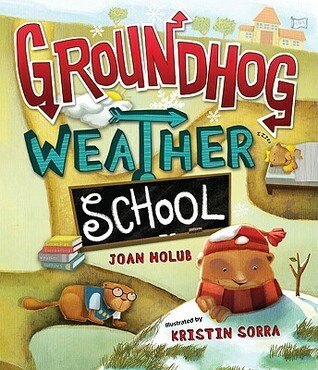 Groundhog Weather School by Joan Holub and illustrated by Kristin Sorra – I saved the best for last. It’s written by the author of Little Red Writing, our favorite picture book of 2013. This one is just as funny. Rabbit is not happy. Groundhog announced “Spring is Here.” So rabbit threw on shorts, flip flops and a Hawaiian shirt. Hopped up her burrow to a ground filled with snow. Then, wrote a letter to complain. Groundhog realized he couldn’t predict weather for the entire country. So he started a weather school. The fun begins. Our favorite line… a student with her head on the desk lamenting, “Shadows? Nobody said anything about shadows. Dark, creepy shadows…” Kristin Sorras’ inventive layouts add to her spunky illustrations. Elementary school students will love this book. They have the experience to appreciate all the school humor – Pledge of Hog-Allegiance, GeoHOGraphy, research reports, lunchtime, drama, Shadow Studies, The Big Test, and Graduation.